Say Keep it goin' to the OB Rag with your donation today! The next CicloSDias is Sunday, March 30, 2014, 10am-3pm. This time it’s about introducing Pacific Beach up to La Jolla to this amazing open streets event. Check out the route above. Decorate yourself, decorate your bike and join us for the first ever CicloSDias Bike Parade! A friendly panel of judges will determine the winners. Top 3 in store for some great prizes! See you on the 30th for a Car Free PB! Folks from OB will be congregating at the Robb Field Skate Board Park. Ciclo­vía,” which translates to English as “bike path” was coined in Bogota, Colombia, a city that began experimenting with its model Ciclovia initiative in 1974 as a response to the congestion and pollution of city streets. CicloSDias San Diego is modeled after similar car-free events held in cities around the world, including New York, San Francisco and Los Angeles. As of 2012, some 80 Open Streets initiatives are held regularly in North America. CicloSDias is all about connecting communities and giving people a break from the stress of car traffic. 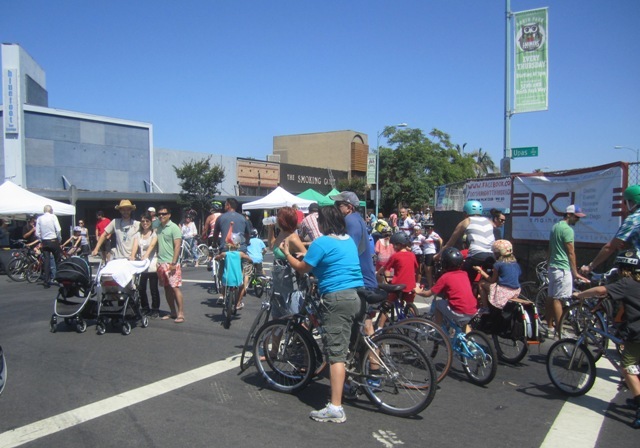 CicloSDias San Diego will bring families outside of their homes to enjoy car free streets. The message is clear – we all want a clean, healthy and vibrant San Diego. CicloSDias welcomes everyone in San Diego to walk, ride, stroll and enjoy our streets. Approximately 2.5 miles of city streets will be opened to families, pedestrians, cyclists, joggers, skateboarders, and anyone else interested in using this public space in a new way. The event will include a “Hub” in 3 different spots along the route – These Hubs will feature CicloSDias merchandise, showcase event sponsors, and host a bicycle repair booth. Event participants are encouraged to check-in at each Hub and receive a free entry into our Bike raffle. For more info, go here. Jan Michael Sauer April 21, 2019 at 5:06 pm on A Golfer With No Quit in Him Rises AgainAgree. Life is not about falling down- it's about getting back up. Vince Lombardi called that "the greatest accomplishment". Peter from South O April 19, 2019 at 2:29 pm on Councilwoman Jen Campbell on Proposed Scooter RegulationsAdd SUI (Scooting Under the Influence) as an issue for enforcement. Daniel Joseph Smiechowski April 19, 2019 at 1:05 pm on Councilwoman Jen Campbell on Proposed Scooter RegulationsTepid at best! td April 19, 2019 at 12:16 pm on Project Review Committee: 3 Projects and Improvements to Dog Beach Walkway – Wed., April 17this was the consensus of the PRC too. Can We Permanently Bury the Idea of a Dog Beach Beer Fest in Ocean Beach? San Diego City Council – Progressive Voter Guide 2018 – Have You Made a Plan to Vote? The OB Rag has been initiated to ply the Ocean Beach community and the San Diego scene with news and commentary from a distinctively progressive and grassroots perspective, and to provide a forum for those views. Others with similar views are invited to contribute and participate. Support the OB Rag! Purchase old copies - 20% off Help keep the OB Rag online by donating to buy 30-35 year old issues of the original OB Rag, Ocean Beach's infamous and iconic counterculture, underground newspaper; limited numbers are available for purchase!